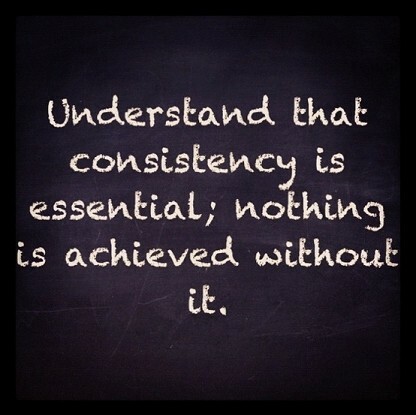 Today’s word of the day is: CONSISTENCY! In today’s world, consistency has seemingly been swallowed up by instant gratification. Instead of sticking to things or working things out, we have fallen victim to giving up or moving on to something else without a second thought. Without even trying we are on to the next. In relationships we seek that Cliff and Clair type of love. It’s ideal. But we don’t put in the work. We don’t communicate. We’re not consistent in showing our appreciation for one another. We’re not consistent in our words or deeds. Instead of calling each other we text. Instead of getting to know each other through the good, bad and the ugly, we get an urge to go left right at the corner of semi-good. When things start to look bad, we’re completely out of dodge, and we don’t even get close to ugly because we’re not too fond of pretty. Every year we’re perpetually trying to lose 10, 15 and 20 lbs. We sign up for our year membership at the gym, declaring that this year we’re going to stick to Kanye’s Workout Plan. We start off with an exercise routine and schedule, but then that becomes too much of a hassle. We’re not seeing results fast enough so we resort to a quick fix, like a waist trainer or some magical tea to do the trick. When all we have to do is stay the course. We say we want to save money, but we stay in the mall. We’re not setting financial goals. So instead of seeing gains all we see is losses. We say we want to be great. We say we want to be successful. We say we want results. We say all these things verbally. We tweet about it. Boast on our statuses about it. We even repost memes about it. But what are we actually doing about it? 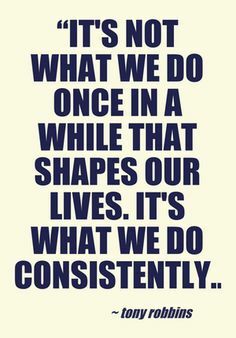 Let us move forward into 2016 with consistency. Let our daily agenda be to stay the course. Let us not do something once or twice and expect success. Let the motto for 2016 be: Consistency and without a shadow of a doubt I’m sure we’ll see the sweet fruit of our labor bring forth nothing short of success!